Did someone say PowerPoint? Well, to be honest, PowerPoint was initially a convenient way of providing and communicating information during a presentation, while helping the presenter to stay on message. However, like meat that has been left on the barbecue for too long, PowerPoint has lost its flavour. Too often it’s now Death By PowerPoint and its overuse drains the life out of your presentation like a leaking pipe. Death by PowerPoint is a common problem for presentations. And because communicating your message-effectively can be the difference between communication skills to Business Executives that inspire and persuade any audience or a failed message altogether. Being aware of strategies that you can implement to avoid falling into this trap will positively impact the success of your organisation. Wondering how you can become a master presenter and communicator like Obama? Follow these tips. Just like ordering a pizza that is delivered hot and fresh, delivering your presentation to an audience in an effective manner can lead to jaw-dropping, mouth-watering reactions. Therefore, you should spend less time preparing a PowerPoint and more time internalising your message. Make sure what you want to put across is literally at your fingertips, and rehearse your delivery multiple times. This will drive the message home much better than boring old PowerPoints. Sometimes having a visual medium for your audience may be necessary. Communicating-information such as data, charts and product-pictures may be the bread-and-butter of your presentation. In such cases, try to use a whiteboard or a flip-chart. They’re much more pleasing to the eye and will keep your audience engaged. They also allow you to stand out from the competition, and communicate in ways that engage, persuade and inspire confidence, generating commitment and buy-in from your team. After all these reasons I’ve given, you still want to use PowerPoint? Fine, but consider some important factors to keep in mind. First off, keep it as simple as ABC. Slides that are packed with content and small font are difficult to read. They’re also a sure way of boring the life out of your audience. Secondly, don’t you dare read out the slide? You should be jailed for that! PowerPoint slides should simply be a guide, a navigation-tool to help you get through the rough and tempestuous-periods of your presentation. Avoid death by PowerPoint by thinking outside the box. Whenever possible, incorporate your presentation with group exercises, audience discussion and periods of reflection. This allows you to address the brief attention spans that most audiences have. Which, by the way, is a mere 8 seconds according to research conducted by MicroSoft Canada in 2014. 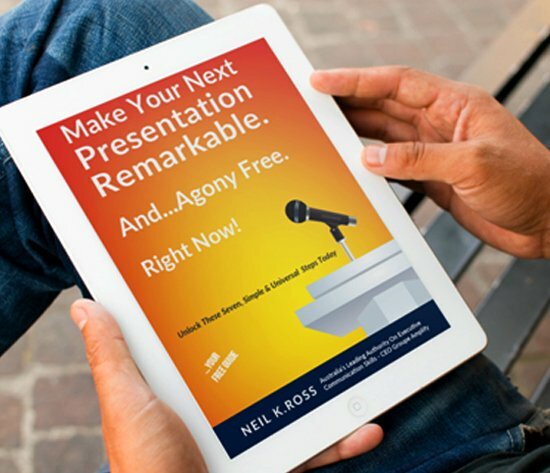 Get more of these Key Strategies for creating presentations that help you outdo your competitors and stand out amongst your peers in our new eBook. Download “Please Shut Up & Start Communicating” here.